Levitation and diamagnetism, or: LEAVE EARNSHAW ALONE!!! A strong collection of permanent magnets are supported by a wooden frame above the ‘levitation’ area, and provide the ‘lift’ for the levitating magnet. 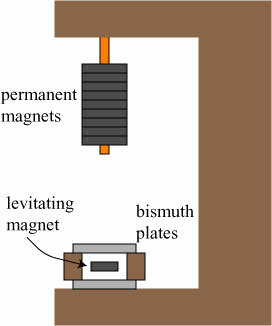 The levitating magnet itself is supported between a pair of plates made of bismuth which — and this is in fact the key point — is a strongly diamagnetic material. It is always annoying to me when someone flashes a bunch of mathematical mumbojumbo in our faces and says something is impossible. Many times the impossibility may be true in the true sense of the mathematical definition, but mathematical definitions often fall way short when evaluating our real and practical world. Someone named Earnshaw, using mathematical mumbojumbo, said that a permenant magnet can not be levitated without using some energy input for stabilization. In the practical sense, one would be a fool to take the Earnshaw therom seriously. The picture shows that permenant magnet levitation can easily be done at home… Diamagnetism probably does not fall within the definition of the Earnshaw therom but who cares. It’s hard to tell if the author is being snarky or really looks upon mathematical physics as a “mumbojumbo” that impedes progress. Taking the statement at face value, it highlights an important and semi-common misunderstanding of many physics theorems, and so I thought I’d take a qualitative stab at explaining Earnshaw’s theorem and its relationship to diamagnetic materials and magnetic levitation. A collection of electric charges or magnetic dipoles cannot be maintained in a stable stationary equilibrium condition by the application of static fields alone. 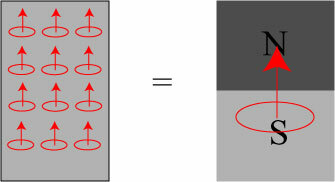 If you’ve ever played with bar magnets, you’ve probably proven Earnshaw’s theorem to yourself without even knowing it! If you’ve tried to make one magnet ‘hover’ using the magnetic attraction of another, you’ve found that the ‘hover’ magnet either sits limply on the tabletop or snaps quickly to the other one. 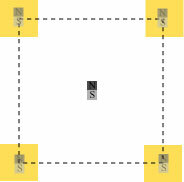 It is not possible to make a bar magnet levitate in a stable position only through the use of other bar magnets. Theorists began to speculate on what sort of material could have properties consistent with the observed properties of light, and Earnshaw attempted to determine the nature of the forces between the fundamental particles of the aether. He found that a system of particles could not be in stable equilibrium if the forces involved followed an inverse square law, in which the force between two particles is a function of , where is the distance between the particles. Such a law is followed by gravity, electricity and magnetism. He concluded that the aether must be affected by two forces: an inverse square law force which is attractive, and a force which is not inverse square and is repulsive. Earnshaw’s speculations about the aether are now obsolete and mostly forgotten, but his observations about inverse square law forces were of fundamental importance. Mathematically, it is straightforward to prove Earnshaw’s theorem through the use of vector calculus. I like to keep things non-mathematical on this blog for the most part, however, so we will instead give a plausibility argument for Earnshaw’s theorem for a simple model system. Force 1 is equal and opposite to force 4, and force 3 is equal and opposite to force 2. Is this a stable configuration? In other words, if we move the test charge away from its center position, will it be pushed back towards the center, or will it slide out and away? Clearly, if the test charge is pushed directly towards one of the corner charges, it will be pushed back towards the center. If we push it towards charge 2, for instance, it will feel a greater force from charge 2 and a lesser force from charge 3 (remember, force is proportional to ), and it will be pushed back towards the center. 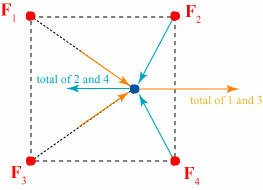 Though, individually, force 2 and force 4 are greater than force 1 and force 3 due to the inverse square relationship (in the picture, they have longer arrows), as the charge gets closer to the midpoint between charges 2 and 4, their forces begin to point almost completely in opposite directions and cancel each other out. 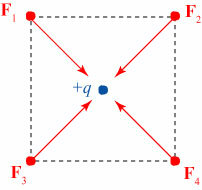 Simultaneously, the forces produced by charges 1 and 3 begin to point in the same direction and reinforce one another. If one works through the mathematics, one can show that this cancellation/reinforcement is more important than the inverse square decay, and a charge displaced along the path between two charges will be completely pushed out of the square! This ‘four point charge levitation device’ apparently has a ‘leak’ along each of the lines between charges. Again, we note that this is by no means a proof of Earnshaw’s theorem, but a plausibility argument. Using vector calculus, one can show that a levitation device composed of any set of point charges/fixed magnets will have a ‘leak’ and the levitation will be unstable. Because of this instability when using static fields, one can only create levitation/trapping with permanent magnets if the fields are time-varying or the levitating magnet is spinning. This latter possibility is used in the very-clever-but-hard-to-make-work-properly toy called the Levitron. Time-varying fields are used by researchers to trap ions for study in so-called quadrupole ion traps. Magnetic levitation trains which rely on permanent magnets use some sort of dynamic feedback to keep the train stable and running. Permanent magnets are not the only materials which react to a magnetic field, however; materials exist which are paramagnetic and diamagnetic. To understand such materials, one must understand a little bit about magnetic dipoles. The little loop and arrow on the right is the typical way to sketch a magnetic dipole: the dipole has a ‘direction’ which points from the south pole to the north pole. 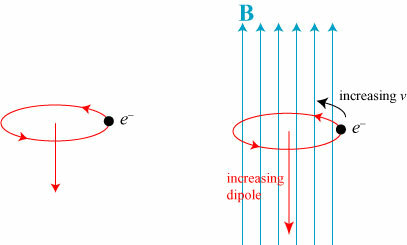 Because of the negative charge of the electron, the magnetic dipole increases in a direction opposite to the direction of the applied magnetic field. 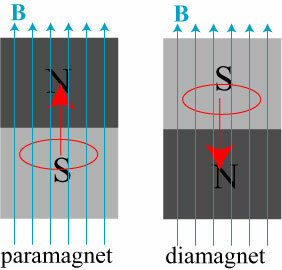 The net result is that the diamagnets closest to the bar magnet push it away very strongly, while the diamagnets far away push it very weakly. This increasing and slackening of force keeps the magnet stably near the center of the system. The ‘leak’ that we found earlier in our four point charge/bar magnet system has been ‘sealed’ by the varying strength of the diamagnetic response. How does a diamagnet violate this theorem? A static field is one which is unchanging in time; the field of a diamagnet, however, changes in response to the motion of the levitating magnet — the fields of diamagnets are time-varying, i.e. not static, when the levitating magnet moves! Earnshaw’s theorem, which applies only to fixed magnets (and paramagnets), therefore does not apply to diamangets. To be fair to Earnshaw, diamagnetism was not really well understood until the pioneering work of none other than Michael Faraday in the 1840s, well after Earnshaw’s theorem was published. And, as we noted, Earnshaw wasn’t concerned with magnets at all! We can now understand the role of diamagnetic materials in our original levitation device. 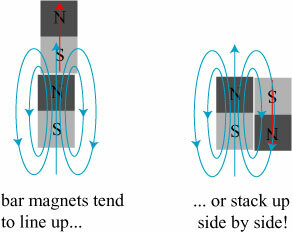 The stack of permanent magnets provide the heavy lifting, while the diamagnetic plates maintain the position of the levitating magnet and provide its stability. They act very much like a pair of fellows escorting a drunk friend home: whenever their friend ‘wobbles’ in their direction, they apply some gentle pressure to direct him back upright! Our would-be Earnshaw basher highlights an important issue that is always good to remember in theoretical physics: even physical theories which are seemingly very general are often built upon assumptions which may not be universal. In the case of Earnshaw’s theorem, brief textbook discussions about it rarely point out explicitly that it doesn’t apply to diamagnetic materials. Often very interesting results can be discovered by challenging the assumptions of broad physical theories; I’ve actually blogged in the past about a few examples. In recent years researchers demonstrated experimentally light beams which propagate “superluminally” through a material medium; this result challenged the commonly-held belief that the group velocity of a wave has no meaning when it exceeds the speed of light. Another example: for years it was assumed that it is impossible to make ‘perfect’ invisible objects. 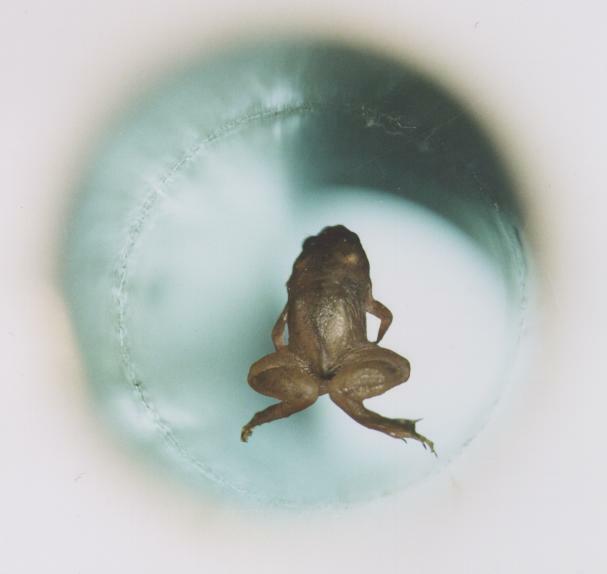 The proof of impossibility, however, assumed that the material was isotropic; once anisotropic materials were considered, researchers demonstrated that it is in principle possible to make a perfectly invisible object (at least at one frequency of illumination). To a lesser extent, I’ve challenged an assumption in a similar way in my own research. In proving a general theorem about the focusing of light, my colleague and I noted a “loophole” in the proof that, when applied, made the focused wave behave very differently. 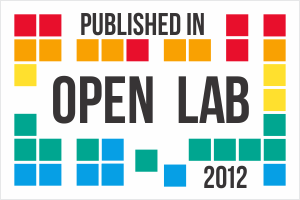 That observation has led to two papers so far, and counting! Physics, and science in general, is all about challenging assumptions, and doing so can pay great research dividends. Our at-home levitation researcher’s criticism of Earnshaw’s theorem highlights the importance of understanding the boundaries of even seemingly broad physical theorems. So let’s cut the old-timer a little slack, eh? * Samuel Earnshaw, “On the Nature of the Molecular Forces which Regulate the Constitution of the Luminiferous Ether,” Trans. Camb. Phil. Soc. 7 (1842), 97-112. Wikipedia makes a minor mistake and states that the theorem was proven in 1842, though it in fact was read to the Cambridge Philosophical Society in March of 1839. The complete transactions volume 7 was published in 1842. 27 Responses to Levitation and diamagnetism, or: LEAVE EARNSHAW ALONE!!! That’s very interesting — I didn’t know that Earnshaw’s original motivation was to explain the nature of the ether. I’ve mostly heard his theorem mentioned in the context of scientists like J. J. Thompson, who tried to create mechanistic models of the atom involving tiny balls of charge in the late 1800s and early 1900s. 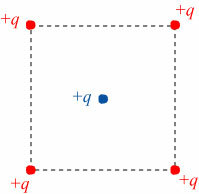 Thompson was aware of Earnshaw’s result, so he tried three workarounds: spreading the charge out (the “plum pudding” model of electrons embedded in a positive sphere of charge), making the charges move (the planetary model of the atom, where electrons orbit the positive nucleus), and modifying Coulomb’s law at short ranges to make it a non-inverse-square law. None of these was fully satisfactory, though. Either they weren’t stable, or didn’t predict the properties of the atom correctly. Bohr’s later model gave up trying to explain what the atom “really” looked like internally, in favor of simply predicting the spectra of simple atoms, and that was the beginning of the end for mechanistic models of the atom. Wade: Well put! I was thinking of adding a statement about Thomson’s model, but managed to completely forget about it in my “get-it-done”-itis. Have you seen my old post on early atomic models? I guess I always admired Thompson because he really turned over every stone trying to come up with a model of the atom that had visualizable, concrete inner workings (what Schrödinger would have called “Anschaulichkeit”). It would be nice if our current best theories were a little more visualizable, but apparently it’s just too hard to create a theory that’s both correct and concrete. So at last I stumbled upon some illuminating answers on a “hard-to-google”-subject. Isn’t it weird how for some problems the web tends to shrink the needle first while expanding the haystack? Unfortunately, although I was initially in agreement with your argumentation I became a bit confused later. I thought I might recount the problems I had in the hope it might help others with similar difficulties. But then it occured to me that simply inverting the setup seemingly would violate this theorem. E.g. : Suspending a diamagnet like bismuth (understood as “a collection of electric charges or magnetic dipoles”) above an array of permanent magnets (“application of static fields”) would constitute levitation in a static field. So I turned to your wikipedia-link. There I realized that I was on the wrong track and why diamagnetic levitation in both setups doesn’t have any bearing on Earnshaw’s Theorem. 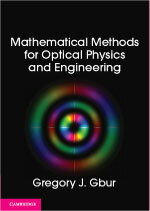 The main point is not whether the applied fields are static or not. More importantly, Earnshaw’s Theorem is far more specific than I had assumed at that point and the trolls can be shot out of the air where they are smugly levitating simply by pointing out that Earnshaw’s Theorem in essence only refers to point charges. Which means that all extended bodies (what a potential troll would refer to as the ‘real and practical world’) were initially outside the boundaries of the theorem. Even the theorem’s later expansion for certain extended bodies explicitely excluded diamagnets. (Physicists 2, trolls nil) And of course you stress the general importance of boundaries in the understanding of scientific theories. But unfortunately this only occurs at the very end of your article and it doesn’t include the explicit boundaries for Earnshaw’s Theorem. So in the end, I guess, I would like to point out and sum up as politely as I can that the article’s argumentation is unfortunately weakened by its structure. 2dotO: Thanks for the comments! I agree that my original statement was missing a few connecting steps; I’ve revised the post significantly to try and make my point more clear. The annoying attitude aside, part of these troll-reactions are based on the fact that they are frustrated already by unexplained statements being offered as answers. Inadvertantly, despite all the insights you gave me and which I really appreciate, you proved his tacit assumption right. I would disagree that I proved his assumption right! It is true that there aren’t a lot of clear explanations out there, but the reality is that very general physical theorems like Earnshaw’s theorem cannot be easily explained without recourse to the math. (As this post demonstrates.) Furthermore, my impression is that the ‘troll’ never actually tried to learn about Earnshaw’s theorem. For the purposes of Earnshaw’s theorem – – would you characterize magnetic arrays such as halbach arrays as exhibiting diamagnetism – – or would their magnetic phenomena still be pure ferromagnetism ? Hmm… I wasn’t actually familiar with the term “Halbach array” until you brought it up! With that caveat, a brief investigation suggests that such an array would still be purely ferromagnetism. 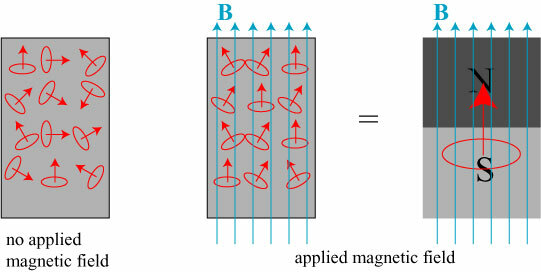 Such arrays can be used in maglev trains without diamagnetism, however, because there is an explicit time-dependence in the motion of a train above permanent magnets. Earnshaw’s theorem breaks down when there are time variations in magnetic fields, as well. Another way of convincing others to your line of thought is via the explanation of radiation and it connection to the two vectors of the Standard Model as espoused by Einstein. result is the equal and the same of Maxwell’s equation for radiation. of a radiator together with the counter gravity vector which is required for straight line trajectory as seen with radiation where each particle or unbound electron is accelerated carrying a digital sample of communication. When a time varying field is applied to a radiator the skin effect for resistance is removed along with the external magnetic field such that the current exits from the radiating member up to the under surface provided by residing particles where the two vectors supplied are equated as the acceleration forces of charge. The above is easily corroberated by winding a pancake radiator which is the equivalent to a Gaussian field in equilibrium which, with the maximum density of wire surface , correlates with maximum residing static particles for the creation of loss less radiation. There is a major fly in the ointment in respect of your explanation. 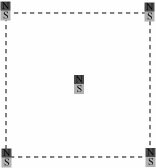 You wrote: “Such a law is followed by gravity, electricity and magnetism” (inverse square). This is not true of magnetism. Magnetism follows 3rd power law and dimishes with the inverse third power of distance. You may be thinking about the specific dipole field, which does obey an r^-3 law. The Biot-Savart law, however, which describes the magnetic field of an infinitesimal current element and is in essence the analogy to Coulomb’s law for electrostatics, is an r^-2 dependence. In essence, magnetism is also inherently an inverse square law force — the absence of magnetic monopoles then makes the dominant contribution to this force an inverse cube one. The Biot-Savart Law applies to what is effectively a two dimensional case. Because of that any effect will be described by second power law. An actual magnet is a volumetric entity and the force field produced obeys 3rd power law. That includes the magnetic field from a solenoid that is energized by a constant current. It IS the specific dipole field that constitutes the manifestation of magnetism as a component of the electromagnetic force. The absence of monopoles isn’t just a convenience. They are not permitted in the standard model. Any attempt to extend the standard model to include them requires either very early annihilation or absolute confinement similar to quark confinement. The Biot-Savart Law applies to what is effectively a two dimensional case. ???? The Biot-Savart law is a fully three-dimensional law; I have no idea what you mean by it being “effectively” a two dimensional case. The absence of monopoles isn’t just a convenience. Nobody said it was. Discussions of the standard model don’t really add anything to the discussion of Earnshaw’s theorem. Your assumption seems to be that the absence of monopoles somehow fundamentally changes the behavior Re: Earnshaw’s theorem. It doesn’t; Earnshaw’s theorem applies equally well to groups of electric dipoles or quadrupoles as it does to groups of point charges. Though there are certainly differences in the behaviors of electric and magnetic forces, they possess a very similar structure that is, as I understand it, all that is necessary for the development of Earnshaw’s theorem for magnets. When the Biot-Savart law is extended to the three dimensional case it becomes a third power law as it must. As for what the standard model has to do with this discussion that depends on why you raised the question of monopoles. They aren’t relevant to Earnshaw’s Theorem but third power law most certainly is. The simple point is that magnetism follows inverse third power law, not inverse square. While that doesn’t change Earnshaw’s it does affect your description of same. When the Biot-Savart law is extended to the three dimensional case it becomes a third power law as it must. You’re missing the point: Biot-Savart law *is* a three-dimensional law! The fundamental element of integration is still 1/r^2, regardless of whether one is integrating over a line, surface, or volume. This inverse square – inverse cube discussion is a diversion from the original discussion of Earnshaw’s law. Is it possible that any attraction or repulsion at a distance that follows any inverse power law at all will be unstable? Intuitively, whether it is inverse unity, square, cube, or even higher power, the static field model will be unstable. You state that scientists in the 1800’s believed in the aether and this was debunked by Einstein, but surely Scottish physicist James Clerk Maxwell (13 June 1831 – 5 November 1879) deserves credit for his theory of electromagnetism during his lifetime in the 1800’s? Many physicists consider Maxwell to be the 19th-century scientist having the greatest influence on 20th-century physics. His contributions to the science are considered by many to be of the same magnitude as those of Einstein. I try and avoid making declarations of “greatest influence” when I can, since the history of science is invariably a series of interconnected discoveries and insights that involve many people pushing to the big changes in our view of the universe. That being said, Maxwell is certainly one of the biggest influences on 20th century physics, and beyond! i need some expert advice on magnetic levitation – trying to solve an ancient Indian riddle which has perplexed many since centuries. . is this thread active.